Happy spring! 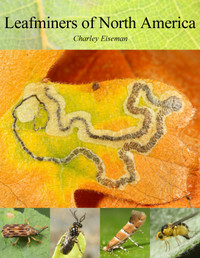 You may be wondering where I’ve been for the past few months, unless of course you’ve subscribed to the monthly leafminer book installments, in which case you know I’ve been busy putting together a 383-page illustrated introduction, complete with overviews of all of the known groups of North American leaf-mining insects and their predators and parasitoids. The moth chapter in particular was a major undertaking—it turns out that leafmining has been documented in 40 families of Lepidoptera, with one in every ten described species mining leaves for at least part of its larval development. From here on out, I’ll mostly be adding illustrations and making minor edits to the keys and species accounts I’ve already written. Having reached this milestone, on April 1 I decided it was safe to take all of the overwintering bugs out of the fridge. Three days later, the first adult emerged: Dyseriocrania griseocapitella (Eriocraniidae), which for reasons unknown to me someone has decided to call the “Chinquapin Leaf-miner Moth.” Okay, it’s one of just two leaf-mining moths that have been specifically recorded from chinquapin (Fagaceae: Castanea pumila), but if anyone did some looking I’m sure they’d find that some of the other 15 moths known to mine Castanea leaves can also be found on that species. Larvae of D. griseocapitella are much more commonly found mining leaves of various oaks… along with at least 130 other North American insects. I do think the common name for the family Eriocraniidae, “sparkling archaic sun moths,” has a nice ring to it though. Two days after the leaves were plucked, three larvae exited their mines and I gave them a jar of soil to burrow into. The position of the flash heads makes a big difference in the appearance of the sparkly wings. Although I like the second one best, the occasional purple scales in the third one are pretty nice. So, it’s clear where the “sparkling” in “sparkling archaic sun moths” comes from. The “archaic” refers to Eriocraniidae being one of the most “primitive” lineages of moths. An interesting feature shared by the three most “primitive” families—Micropterigidae, Eriocraniidae, and Acanthopteroctetidae—is that the pupa has free antennae and legs as well as functional mandibles, which it uses to wriggle its way to the soil surface so that the adult can emerge. Remembering this, I hunted around a bit and was able to find the pupal exuviae poking out of the soil. The leaf-mining microlepidoptera will be very exciting with the leaf mines and adults very well photographed. 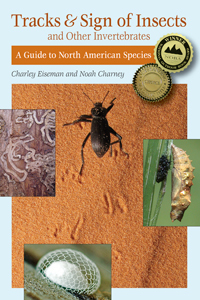 My first interest in insects was when I was about 14 when I collected microlepidoptera. I recollect collecting those primitive purple moths around birch during the war (1941). It was on a golf course near Bristol and a German bomber was somewhere overhead. They tried to make daylight raids on Filton, a nearby wartime aerodrome. This entry was posted in Uncategorized and tagged Dyseriocrania, Dyseriocrania griseocapitella, Eriocraniidae, Fagaceae, larva, leaf mine, Lepidoptera, moth, oak, pupa, Quercus. Bookmark the permalink. Reminds me of the childhood book, The Rainbow Fish, by Marcus Pfister. Next book: The Rainbow Moth. Hi Guy – Interesting, I never heard of hoverflies migrating! The only mining hoverflies I know of are European Cheilosia spp. ; it would be nice to have some show up here! That moth is clearly David Bowie in Labyrinth! I can’t dig up a scene when he’s in profile and wearing a glimmering cloak, but maybe it was left on the cutting room floor.